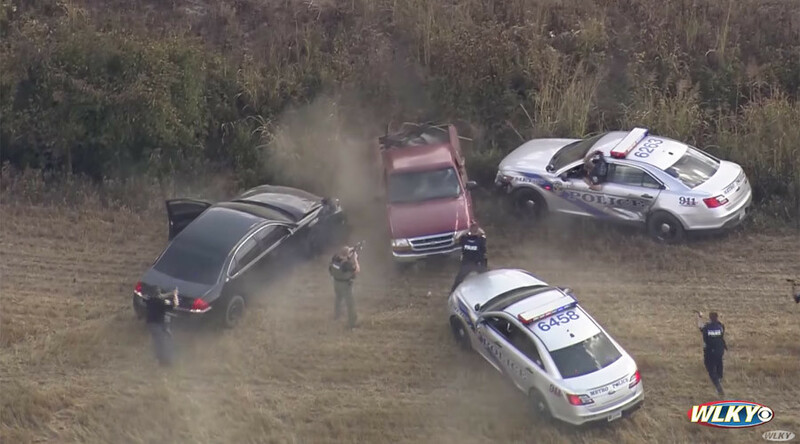 News helicopters filmed a real-life ‘Grand Theft Auto-like’ car chase as police pursued the driver of a red pickup truck across two US states. The dramatic chase started in Louisville, Kentucky, Thursday after officers noticed the truck matched that of a man wanted for stealing purses from women at gas stations, reports WDRB – and once the pursuit started, it continued right across into neighboring Indiana. The 45-minute chase involved the Louisville Metro Police Department and Indiana State Police, 22 police vehicles and dozens of officers who chased the suspect around an obstacle-ridden college campus and into a corn field. The lengthy chase reportedly came to an end when the suspect, identified as Robert G. Ellis II, ran over police spike strips before his truck was rammed by a police cruiser. A dozen officers swarmed Ellis, with some appearing to strike him repeatedly as they made their arrest. Ellis was hospitalized in Floyd County for injuries sustained in the incident, but remains in Indiana State Police custody. He was charged with fleeing and resisting law enforcement. It’s not yet known if he will face charges in Kentucky.